Trucks are very popular vehicles that are excellent for carrying equipment and tools in. As convenient as the bed of a truck is, it is not convenient or fun to drive around with tools rolling around the bed of the truck. We selected 15 of the most popular truck bed tool boxes on the market and looked at construction, sturdiness, design, finish, materials used in construction, sizes available, mounting style, and customer reviews. The three tool boxes featured here make great choices for the truck owner who is looking for the perfect tool box for keeping his tools safe and organized. A truck bed tool box is an excellent solution to organizing your tools and equipment so it is in a secure place. This way the bed of the truck won’t get scratched up and dented by tools bumping around and it secures them from theft as well. There are a lot of different truck bed tool boxes on the market to choose from. Knowing which one is the best can be a challenge if you don’t know much about them. The purpose of this guide is to help you understand the differences between the truck tool boxes so you can eliminate the ones that do not have what you’re looking for and select the right one for your truck and tool needs. We have also provided you with reviews of three of the top rated truck bed tool boxes available. These three models are excellent examples of high quality tool boxes that provide convenience and style to your truck while taking care of your tool storage needs as well. 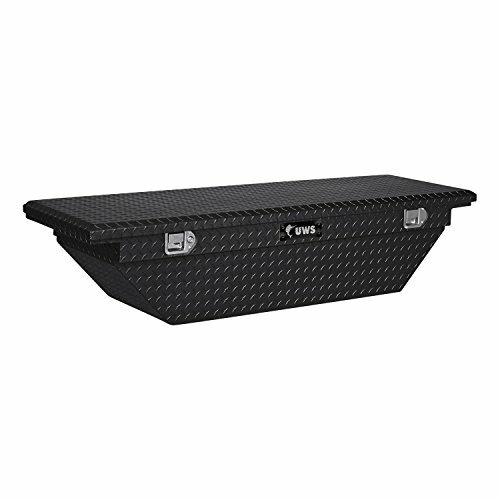 USW offers truck owners this black aluminum truck bed tool box for all of their tool storage needs. The lid is fully foamed and creates a barrier wall between the outside aluminum layers which will prevent the lid from warping or bending. The locking handles are made from stainless steel and provide plenty of security and strength. The 3 compartment sliding tray provides rust free storage for small items, making it easy to retrieve them when needed. The one piece tub has plenty of room and strength to support heavier loads and will not leak either. The self closing struts on the lid automatically close it with an easy pull so even if your hands are full, the tool box will be securely closed and the contents safe. There are two trays that are built-in and screwdriver holders that provide extra strength to the tool box. The lid opens a full 90 degrees so loading and unloading the tools is easy and convenient. The angled design is low profile and beveled so there is a better view out the back window. It looks stylish too. The high quality construction of this truck bed tool box will provide a great place for you to store your tools for a long time to come. This full featured truck bed tool box is the perfect box to outfit your work truck with. This single lid, full sized deep truck tool box has a ton of features that make it a popular choice among truck owners. Features include a gear-lock self adjusting rotary lock that is dual and keeps the tool box’s contents safe from theft and damage, self aligning latch pins that pivot back and forth, sideways and lock tight, giving the box plenty of security, end mounted push buttons that make access easy and convenient and more. There are no adjustments required to the gear-lock system. The 4 compartment sliding tray is convenient and holds lots of items. There is built in storage bins on either end of the tool box and the lid is strengthened by an RSL laminated lid bolster that adds even more strength to it. This helpful and convenient truck bed tool box is finished with Tough Armor-Brite Powder Paint that is rust resistant so your tool box stays looking sleek and stylish. This is the truck bed tool box to choose if you are looking for a reliable company, a super strong and long lasting tool box and plenty of storage and convenience. 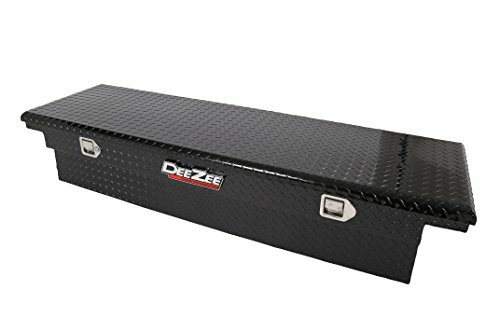 Dee Zee is the place to go for a high quality, non-rusting aluminum truck bed tool box. It is covered with a glossy powder coating that protects it from scratches and scuff marks. The paddle handle latches are made from commercial grade stainless steel and are built to last. The lid features a double V pan lid stiffener that ensures rigidity and superior strength. There is also a closed cell foam gasket that prevents rain, dust or snow from getting inside the box. The internal bends and 3 piece design of the body add tremendous strength to this convenient and stylish truck bed tool box. Other features include self adjusting strikers, dampened gas shocks, and a removable plastic tool tray that is perfect for keeping all the small items in one place and easily accessible. Truck bed tool boxes are a great way to keep all of your tools and smaller equipment organized. It also prevents it from rolling around the bed of your truck while you are driving. The three top rated truck bed tool boxes that are featured above are great examples of high quality, durable tool boxes for your truck. All of them are constructed to last and have coated finishes that protect them from scratches and scuffs. Read the buyer’s guide below to learn more about how to choose the perfect truck bed tool box for your needs. This information will give you a good understanding of the different kinds of truck bed tool boxes that are available and how to sort through all the available choices so you purchase the right one for your truck. There are several reasons that purchasing a truck bed tool box is a good idea. Even though you may think that laying your tools in the truck bed will be fine, they will inevitably roll around while you’re driving and they are susceptible to theft as well since they are just lying in the back. In addition to theft, there are the effects of the elements to consider as well. A place to keep all your tools organized and in one spot so they are easy to grab when you need them. There are many different kinds of truck bed tool boxes on the market to choose from. They can range from a basic, no frills utility box to the fancier, feature-rich styles that have a lot of storage and other features. Many truck owners are fine with a basic box, but this is largely up to personal preference and what your specific tool storage needs are. We’ve listed a few tips that will help you get a better idea of the type of tool box you want to get for the back of your truck. A crossover toolbox has a single lid that is supported with a single strut. This is a good, basic choice if you are on a tight budget and want something functional without spending a lot of money. The mid-range truck tool box is a solid choice that features twin struts and weather seals to keep the elements off your tools. These are good all around choices that are middle of the road in price as well. If you’re looking for a top of the line tool box for your truck, look for deluxe models that have a lot of features such as stainless steel construction, tool trays for smaller items, high end weather seals and plenty of room for your tools and small equipment. They may cost more, but you will get a lot out of them as well. There are several different types and styles of truck bed tool boxes on the market. They will vary according to how they attached to the truck bed, the materials they are made of, the finishes they have and the configuration of the lids. There are other features that are possible as well including trays, extra storage bins, durable weather seals and much more. We have listed the most common types of truck bed tool boxes that you can choose from. The different types are largely differentiated by the mounting style it has. Crossover – A crossover truck bed box is installed right behind the cab. They are the width of the cab with the edges resting on the sides of the bed. They don’t usually fit flush with the bed of the truck which leaves a little space below it for more storage. This type is pretty basic and simple in design and is a good option for those looking to save money. 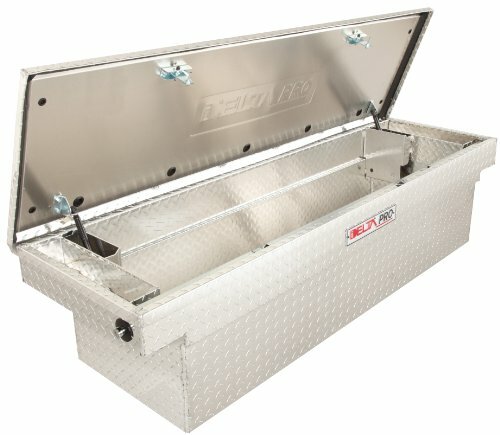 Chest – This is another model of truck bed tool box that is installed behind the cab of the truck, but this style sits directly on the floor of the bed and doesn’t rest on the sides of the bed. The benefit to the chest style tool box is that it doesn’t obstruct the view out the back window and can fit under special tonneau cover. The downside is that you will lose some floor space of the truck bed. Side – Side truck bed tool boxes attach to the side rail of the truck on either side or you could get two and put one on each side. They typically don’t extend to the floor of the truck so there is some room for additional storage. This type of tool box doesn’t take a lot of space and makes the tools very easy to reach when you are standing beside the truck and need to reach your tools. Sliding – This is a unique style of tool box that sits on a special rail system that allows the box to slide back and forth so the box can be moved easily where you need it to be. This makes the tools easy to access as well. Hitch – This type of tool box will not block the view out the rear window and doesn’t take any of the truck bed space either. It attaches to the trailer post of the truck. Trucks that do not have a trailer post will not be able to use this type of tool box. Tailgate – This is another style that doesn’t take up any truck bed space and makes the tools easy to access. It is installed by attaching it to the tailgate of the truck and swings down when the tailgate is lowered. Truck bed tool boxes are made using a variety of different materials. The most common materials used in tool box construction are aluminum, stainless steel and steel. Each one has its advantages when it comes to tool boxes. Aluminum – The majority of truck bed tool boxes on the market are made from what is called bent sheet aluminum. Most often you will see a diamond pattern on these tool boxes that is very rugged. It will not deteriorate or rust and is very durable and lightweight as well as being stylish. Stainless Steel – Some truck bed tool boxes are made from stainless steel although these are almost always the premium models that cost more. This corrosion resistant material can be polished to have a gorgeous shine and doesn’t need a powder coat finish to protect it. Steel – This is the most traditional material that is used to make truck tool boxes. Steel tool boxes will definitely weigh a lot more than aluminum but this extra weight also protects the tool box from getting dented and messed up from tools bumping around inside. The steel truck bed tool boxes have a powder coated finish to keep the walls of the box from corroding. The only drawback is that if the coating gets chipped, corrosion such as rust can creep right in. Truck tool boxes offer truck owners a choice of three basic colors for the most part. The majority of models are available in these finishes since they tend to blend really well with most truck paint jobs. White – The majority of truck tool boxes are offered with a white powder coated finish. Not only does it look crisp and clean, it prevents rust and corrosion as well. Black – There are many truck tool boxes on the market that are offered with a black powder coating that protects it and makes it look stylish and professional. Bright – This type of finish can be polished to a great shine and has a pattern of raised diamonds all over it. This is a very common finish chosen by those who work in the construction field. One of the first and most important steps in choosing the right truck bed tool box involves knowing what your specific storage needs are, how much space you have to work with and how it will be installed. With all of these factors and more a consideration, it can be very hectic and not as planned at all. We have selected information that will help you understand the differences between the different tool boxes so you can narrow the choices down to a small, manageable list. Make sure that you know exactly what your needs are when it comes to storing tools and/or small power tools too. Once you know exactly what you need the tool box for, you’ll be able to sort through all of the choices available and make a choice that will provide you with a truck bed tool box that will help you stay organized, protect your tools and last a long time too.